Chelsea Clinton got engaged to... a Jew, Marc Mezvinsky, the son of former congresspeople Edward Mezvinsky and Marjorie Margolies-Mezvinsky. It's... Boris Week! Why? Why not! We start with Russian astronaut Boris Volynov (yes, there will obviously be a Russian tilt this week). Some Borises who did not make the cut: wrestler Boris Malenko (Jew), chess champion Boris Spassky (Not a Jew), actor Boris Kodjoe (Jew), NASCAR driver Boris Said (Not a Jew), spy Boris Rybkin (Jew), and drunk President Boris Yeltsin (Not a Jew). And Boris Becker is already profiled, of course. I wrote this after watching "The Band That Wouldn't Die", the story of the Baltimore Colts marching band, on ESPN's 30 for 30. 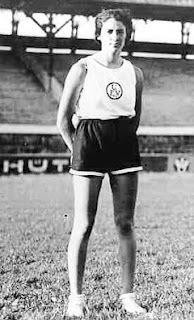 It's a fascinating story: Margaret Bergmann Lambert, a German Jewish high jumper from the 1930s, now 95 and living in Queens, had her national record taken away by the Nazis... but now, 73 years later, it's been restored. Other Jewish Muppets include...ummmmm...well.....maybe the old guys on the balcony? For now it looks like Guy Smiley is the only Muppet mensch (and in hiding, at that). When Isaac from Eugene, OR suggested that we profiled Socrates, I was a tad miffed. But since he did point out that Socrates made many mentions to "the God" (Philosophy 101 at the U. of Oregon? ), that gave me a nice lead-in. Our server was hit by a lightning storm over the weekend. The hosts are trying their best to resolve it, hopefully we'll back up later today. Katey, of course, was also Leela on "Futurama". Reader Andrea from California alerted us of Miss Stewart being listed as Jewish on various sites. We did some research... debunked. The sites have now been fixed. But at least it got Kristen profiled on JONJ, with perfect timing for today's release of "New Moon". The New York Times blog talks about the new biography of Louis Armstrong, Pops: A Life of Louis Armstrong, which discusses his relationship with Jews. Thanks to reader George from Maryland for the link. Moishe had seen Rita Hayworth referred to as "The Ultimate Femme Fatale" somewhere and thought that was a great idea for a profile. He asked me to write it, probably because of my previous experience. Something to look for: a few of Hayworth's lines in this scene are direct quotes from the actress herself that I dug up online. I think they really add to the overall feel. Hayworth, who has Spanish Jewish ancestry, was suggested by Ben from Madrid. Is Tim Whatley the most obscure JONJ profile ever? It's gotta by close with Artie Ziff, right? So how is it we end up profiling the dentist from a few random episodes of Seinfeld (this one in particular being an all time great episode, we grant you), while such deserving fellows as Gene Wilder sit on the sidelines? In the end, it's because there needs to something interesting to write. If we can't think of anything, then we're kinda stuck. I was watching the Whatley episode and I had an idea for a profile. Meanwhile there's nothing to say about Wilder except "he's great, he's Jewish, yadda yadda yadda." Whatley was suggested by my own brain. Thanks brain! In the blog posting for Kafka, I wrote: "Why can't we profile Nabokov?" Soon after, reader Michelle from Bloomington, IN, wrote: "[Nabokov's] wife was Jewish... Apparently he identified with Jews. See the article "'Nabokov's Minyan': A Study in Philo-Semitism" by Shalom Goldman from Modern Judaism for more info." Great. We had our Jewish in with Nabokov! And now, with the "The Original of Laura" out today after being hidden for 30 years, here it is. Judd Apatow... check. Paul Rudd... check. Seth Rogen... check. Jonah Hill... check. James Franco... check. Now, Jason Segel... check. Even the women: Rashida Jones... check. Mila Kunis... check. Elizabeth Banks... check, and how! Katherine Heigl... Not so much. There's one in every bunch. Thanks to Jake from NYC for the suggestion. Jews in the News: A Jewish world boxing champion! That's right... And he's not only Jewish, he's Orthodox, and studying to be a rabbi. 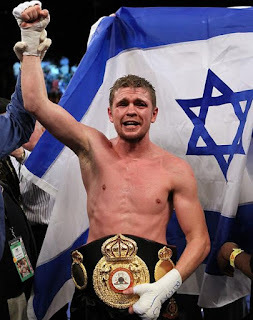 Belorussian-born Israel-nationalized Brooklyn-residing Yuri Foreman became the WBA super welterweight champion after defeating Daniel Santos of Puerto Rico. "Boxing is sometimes spiritual in its own way. You have the physical and mental challenges in boxing, just like you have lots of challenges in exploring the different levels of Judaism. They are different but the same." January 7, 2010: Foreman is now profiled. One of the ground rules of the Jew Score is that a Jewish spouse for a non-Jewish profilee gives them an I Score of 1. But in Pamela's case... well, four months can't get you a point. Sorry. Maybe in your next marriage. Sometimes, when a reader sends in a suggestion, we write a profile right away (and then post it 6 weeks later because of the backlog). Sometimes... well, it takes a year and a half, as it did here, with Kubrick first suggested by Andres in the summer of 2008. Since then, Sam from Germany, William from Atlanta, and Zachary from Connecticut have chimed in. Somehow, our list of Jewish generals grows... and we haven't gotten to Moshe Dayan yet. Thanks to Mark from NYC for the suggestion. Thanks to the World Series win, we've been getting quite a few searches for Steinbrenner, so we were happy to oblige with a timely profile. George strikes me as SO goyishe, but when there's a "stein" there's a way, I suppose. The Boss was also suggested by the excellently named (and poorly spelled) yankesfan 2444 waaaaaaaayyyyy back in January. Way to be an early trendsetter yankesfan! OK, no. Actually my (admittedly) limited knowledge comes from the novel Sway, by Zachary Lazar, in which Satanism is a bit of a leitmotif throughout. It's a good book and I'd include it in JONJ recommends, except there are no Jews in it (for the record, I'd probably give it 4 stars). In any case, the LaVey suggestion comes from Hubert in Paris. Sacre bleu! Who knew we had such an international readership? Every now and then I just get into the musical mood and burst into song. No, not like that. More like this. And this. As much as I like what I've come up with here, though, I know it's nowhere near as good as what one can find on YouTube. Oh well, something to reach for I guess. Satchmo was suggested by Cliff from New York. Thanks Cliff! I'm a pretty open minded fellow when it comes to sports, honestly. I don't do a lot on this site to hide my loyalties to the Yankees, Giants, Devils and Terriers. But at the same time, my hatreds are pretty minimal. I don't hate the Red Sox or the Redskins or the Flyers. I'd like to see them lose, sure, but I'm not actively rooting for their demise. On the other hand, there are 3 teams that I absolutely completely abhor. And those 3, I don't just want them to lose, I want them to sink into the Earth, swallowed whole never to return to the sports universe again. A loyal reader might point out that last year's Jewies took place in July, but this year's are in November. We will tell that loyal reader that he or she have way too much free time on their hands. Those with a numerical eye may notice we're up to profile number 662. Mightn't we want to do something special for profile number 666? And mightn't Rod Serling and his scary Twilight series about that Zone be perfect for profile 666? And mightn't we, as writers, want to use a real word instead of something made up like "mightn't"? If you're older than 30, younger than 65, and you grew up in the New York/New Jersey/Connecticut area then this is a nice little blast from the past. That's a pretty small window of people if you think about it, so for the rest of the world, there's this.